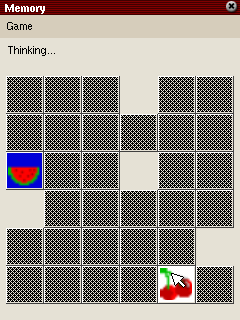 You might like this game if you like thinking and memory games. Memory follows the well known principle of board memory games. A board is covered with tiles placed upside-down. 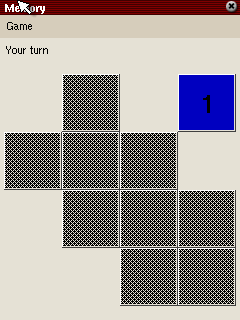 At every move, two tiles can be turned. If they match, they are removed and a point is scored. If not, they turn upside down again and the opponent can try to find matching tiles. This is repeated until no more tiles are left. The game is played against the computer which can play on different levels. The memory games fascinate people and especially children for a long time and this with reason. The simple yet catching game principle keeps you playing. This implementation of memory includes everything necessesary to play a fair game of memory. The different levels and board sizes make it appropriate for everybody. However, there are a few drawbacks. First, the graphics is very simple. The tile backs are just plain grey and the tile fronts are a bit blurred. Also the front tiles distinguish between symbol and background color making it much harder than it need to be. To keep a long term interest in the game there is something like a good highscore system missing. Overall the game can certainly be recommended for children.